The producers of Billy Elliot: The Musical said that a Korean-language version of the show, adapted from the 2000 Stephen Daldry film, would play in Seoul starting in August after years of planning that began long before Billy Elliot won the 2009 Tony Award for best musical. ...Local actors have been hired for the South Korean cast, including a team of four young Billys, and some dialogue or other minor elements may be changed to suit the hometown crowd. But over all the show (whose music is by Elton John and whose book and lyrics are by Lee Hall) will remain intact, and the show’s American design and construction team has built the sets for the Seoul production. 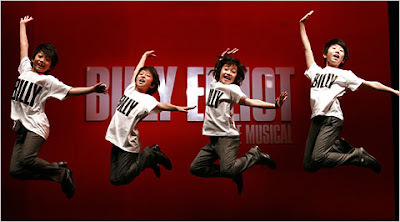 Mr. Fellner said that a Japanese version of the “Billy Elliot” musical was being prepared for the summer of 2011, and talks were continuing with German and Dutch producers but nothing had been set yet.